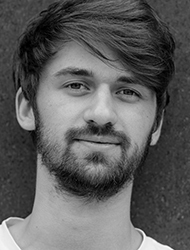 Samuel is currently studying Interface Design at the University of Applied Sciences Potsdam. Before he decided to give his life a new twist in 2016, Samuel spent several years working for some of the mayor ad agencies in Hamburg and Berlin – developing ads and campaigns for the automotive industry. He joined the Design Research Lab in late 2017.